The Roche Cobas Mira S is a fully selective analyzer designed with maximum program flexibility to meet the individual needs of any lab facility from patient selective profiles to STAT and routine batch analysis. Roche Cobas Mira S that sets the standard for consistent performance possesses specifications similar to that of Mira Plus CC, excluding that of the primary tube sampling. By combining all aspects of convenience, reliability, and flexibility, the analyzer is adequate for measuring routine profiles, TDM’s, drugs of abuse, STATs, electrolytes, and special chemistries. 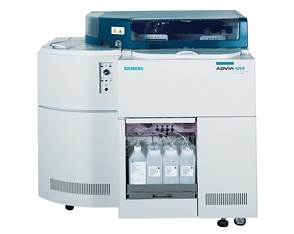 Hitachi 904 is a discrete, fully automated, computerized chemistry analyzer that uses serum, urine, plasma and CSF sample types to perform in vitro quantitative and qualitative tests on a wide range of analytes. In addition it is capable of performing potentiometric and photometric assays. Features of the Hitachi 904 include; STAT results available quickly, ready to use 24 hours per day, 180 tests/hr throughput (photometric), 360 tests/hr throughput with ISE (Ka+, Na+, Cl-), 46 programmable tests, 50 samples on tray, automatic calibration, and refrigerated storage for 64 reagent containers. The Roche Hitachi 911 is a fully automated, discrete, computerized chemistry analyzer that uses serum, urine, plasma and CSF sample types to perform in vitro quantitative and qualitative tests on a wide range of alalytes. In addition it is capable of performing potentiometric and photometric assays. The Hitachi 911 analyzer is composed of two units - the analytical unit and the control unit. Assay Types: Monochromatic, Bi-chromatic, Endpoint, Kinetic, Simultaneous endpoint, and kinetic, Endpoint with sample blanking, Kinetic with sample blanking, Simultaneous double endpoint and double kinetic. The Roche Hitachi 912 is a fully automated, discrete, computerized chemistry analyzer offering reliability, quality and convenience. The Hitachi 912 is an optimal clinical chemistry workhorse system for the small up to medium workload laboratory. The 912 is an extremenly flexible system for the performance of both standard and special clinical chemistries, homogeneous immunoassays, and STAT analyses. Capacity of 35 tests on board (including 3 ISE). Up to 360 tests per hour. Up to 720 tests with optional ISE. The Reflotron Plus System performs 15 blood chemistry tests and calculates LDL. It allows you to quickly and accurately monitor chronic conditions like hyperlipidemia, diabetes, hypertension, and anemia. An on-board hard-copy printer eliminates the chance of transcription errors, simplifies record keeping, and gives you an important tool in promoting patient compliance. Proven dry chemistry technology, which, depending on the parameter, uses whole blood, serum, or plasma samples. This eliminates the need to mix reagents and provides longer reagent stability. An easy-to-follow videotape is included to simplify training. The System Test Summary Card functions as a reminder for sample type, assay time, appropriate sample tube, and storing conditions, which improves accuracy and reduces waste. The system auto-calibrates to ensure the highest accuracy. An integral hard-copy printer eliminates the chance of transcription errors. Uses proven dry chemistry technology that, depending on the paramenter, can utilize whole blood, serum or plasma. Performs 15 blood chemistry tests and calculates LDL. Eliminates the need to transport samples to the lab. Gives results in about three minutes. Individuals with high risk of vascular disease can be identified immediately. A reimbursement handbook and consulting are exclusively available to Reflotron System customers via a toll-free hotline. Toll-free online technical assistance, troubleshooting, and general information are available seven days a week, 24 hours a day at 1-800-428-4674. Assistance for loaner systems is available as needed. The ADVIA 1200 system uses the same reagents, calibrators and controls as the other members of the ADVIA Chemistry family and is based on the same proven reliability.